In the topic, the example of developing the application of “Windows Forms Application” type is considered. This application demonstrates using of lists (class “List“) and using of associative arrays (class “Dictionary“). Using this example, you’ll get the experience of working with classes Dictionary <TKey,TValue> and List<T>, which belong to the generic collections. – demonstration of work the class List<T> for organizing the dynamic array or list. Develop the application of “Windows Forms Application” type by using the lists and associative arrays. The files contain an unlimited number of lines. Every line of file contains the data, which are separated by symbol ‘ , ‘ (comma). the total number of places (integer). the time of ticket sales (string). – organize data into the collection (class Dictionary<TKey, TValue>). – organize data into the dynamic array (class List<T>). 3. Show on the form the flights with a maximum duration of the flight. The calculation must be realized by using the classes Dictionary<TKey, TValue> and List<T>. 4. Show on the form the number of passengers who are waiting for the departure in the entered time. The calculation must be realized by using the classes Dictionary<TKey, TValue> and List<T>. 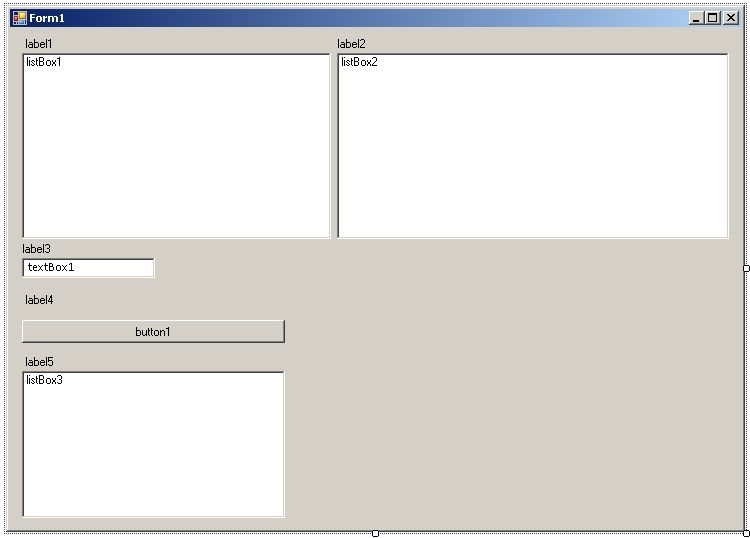 Create the project as Windows Forms Application using the template C#. An example of creating such project is described in detail here. 2. Creating the form of application. 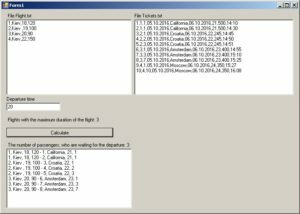 – control of type ListBox (list of flights with a maximum duration of flight). The object named listBox3 is created. Correct the size and positions of controls as shown in Figure 1. 3. Setting of control properties. Setting of control properties is realized by using the “Properties” window of Microsoft Visual Studio 2010. – in the control label5 property Text = “Flights with maximum duration of the flight: “. After setting the properties and correcting the positions and size of controls the main form of application will be as shown in Figure 2. 4. The organization of data in the form of structures. You need to represent as a structure, the data that are placed in one line of any file. It is needed to increase the efficiency work of program. Unlike classes, that are links, the structures are realized as value types. Compared to structures, to access the object of class is needed more allocated memory and resources. 5. Classes Dictionary<Key, Value> and List<T>. Description of the basic data structures. 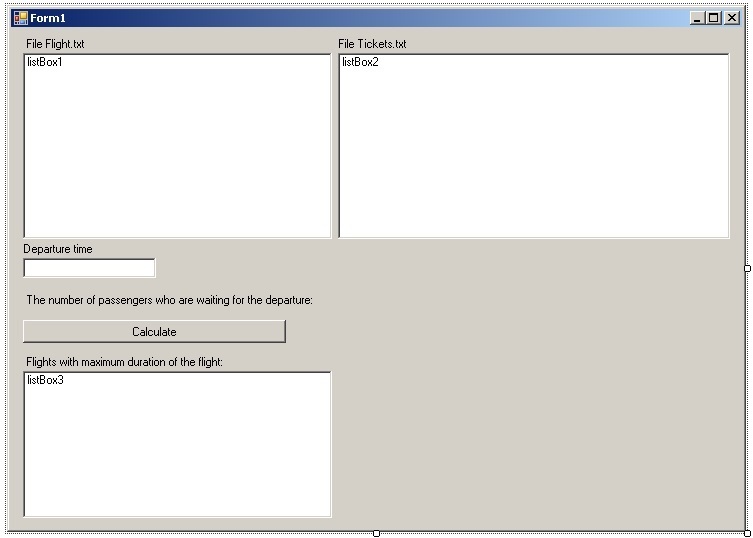 According to the task, data, that are placed into the files “Flight.txt” and “Tickets.txt” are formed in the collections. The collection of type “dictionary” (Dictionary) is provided as “key-value“. The value of a key is unique. For the “Flight” structure is advisable to form data in the form of a dictionary or an associative array. This is due to the fact that number of flight in the list of flights, is unique (cannot repeated). – class Dictionary – belongs to the generic collections. According to the task, you need to use the class Dictionary. In this description, the type int is the flight number. But type “Flight” is the structure, which corresponds to this flight. For the different flights the tickets numbers can be repeated. Therefore is convenient to realize tickets as a generic dynamic array of type List<T>. Instead, type <T> is substituted Tickets structure – as a result is obtained List <Tickets>. // dynamic array (list) of structures "Tickets"
6. Connecting of the System.IO namespace. Class StreamReader. According to the task, in the program is realized the reading from file. .NET Framework class library is a set of tools for interaction between program and files (open file, read file etc). StreamReader class is designed for entering characters from the byte stream. To output the symbol into the byte stream is used class “StreamWriter“. Class StreamReader includes method ReadLine(), that reads a text string from the file. Method ReadLine() returns the string. This method will be used in this task for reading the file. 7. Programming the methods of reading data from files “Flight.txt” and “Tickets.txt“. – forms the list of flights into the listBox1 for it displaying on the form. 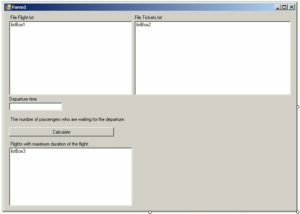 – displays the content of the file “Tickets.txt” in listBox2. Flight sa; // additional variable - structure of type "Flight"
// 1. Reading data from file "Flight.txt"
Tickets tk; // additional variable - structure of type "Flight"
// 1. Reading data from file "Tickets.txt"
Let’s explain some code snippets in the methods Read_Avia() and Read_Tickets(). Reading the string from the file is realized by using method ReadLine() of class StreamReader. If the end of the file, method returns null. is realized the separation of string at the parts. Symbol ‘ , ‘ (comma) is the separator between parts. adds the number of flight and structure sa into the collection avia of Dictionary<int, Flight> type. adds the structure tk into the collection of type List<Tickets>. 8. Code changing the constructor of form Form1(). Methods Read_Avia() and Read_Tickets() are placed into the constructor of form Form1(). 9. Programming the event of click on the button “Calculate“. In the above listing we should note. When viewing the collections used foreach statement (and only foreach). The foreach statement is used for referring to the elements of collection in the loop, which is a group of objects. Using other loop statements is error. The list of flights with a maximum flight duration is displayed in the listBox3 control. The result of running the application is shown in Figure 3.